Phoenix Rising. 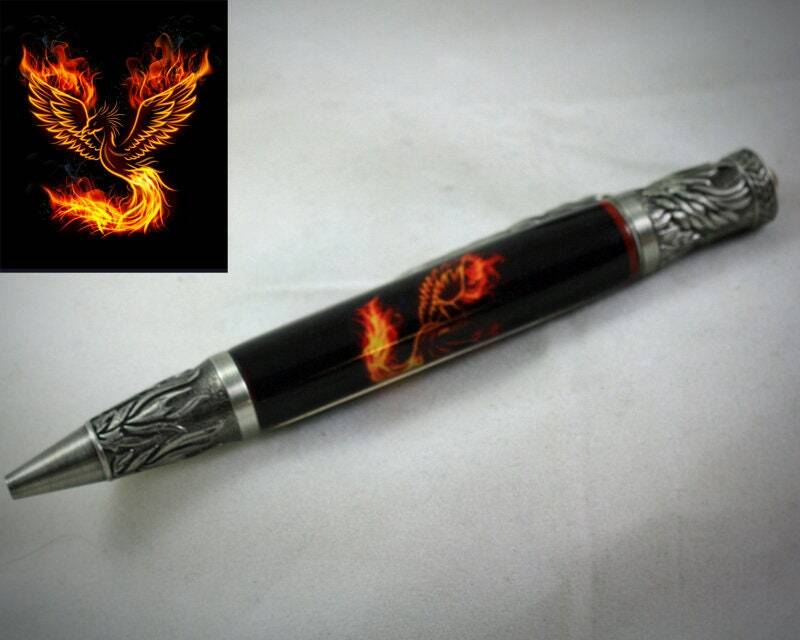 The phoenix bird is a sacred firebird said to have beautiful feathers of gold and red. Its story has roots in many ancient civilizations- most notably the Egyptian and Greek. After 1,000 years the phoenix builds itself a nest of twigs, which then burns fiercely until they are both, reduced to ashes. A young phoenix then rises from the ashes, renewing the life cycle of the bird and making the golden phoenix virtually immortal and invincible. This high quality pen captures the story in detail, from the flames bursting at the tip, to the rising phoenix; it's tail rendered in the clip. Amber crystals on the clip and cap add to the majesty of this regal creature. This is a special novelty pen that fans of Greek Mythology will appreciate. +Approximately 5.25" long, 9/16" at it's widest point. +Buyers are protected by Ohio Penworks industry leading Customer Satisfaction Guarantee (https://www.ohiopenworks.com/customer-satisfaction-policy).